Chairman Marino, Ranking Member Johnson, and members of the committee: thank you for inviting me to testify today. As an economist and senior research fellow at the Mercatus Center at George Mason University, I focus my primary research on regulatory accumulation and the regulatory process, so it is my pleasure to testify on today’s topic. In previous research and testimony, I have highlighted the fact that regulatory accumulation creates substantial drag on economic growth by impeding innovation and entrepreneurship.1 Today, I have three main points that may help you to examine the reforms under consideration. First, I will discuss the regressive effects of regulatory accumulation—or, to put it another way, why retrospective analysis of regulations can result in a what amounts to a progressive tax refund, with benefits going largely to lower-income Americans. Second, I will highlight how an increasingly long and complex regulatory code can actually make the task of achieving risk reduction in the workplace more difficult. Third, I will argue that not all attempts at regulatory reform are equal. In my research, I have found several factors that tend to contribute to meaningful and successful regulatory and governmental reform efforts. The most important of these is the use of an independent group or commission to identify regulations that need to be modified or eliminated. Any retrospective analysis effort that leaves this task in the hands of the same agencies that created the regulations in the first place is unlikely to succeed. I highlight some other important principles as well, but the independence of the reviewers is the most important. Regulations can be regressive, particularly in their effects on prices paid by consumers.2 A regressive regulation is one whose burden disproportionately falls on lower-income individuals and households. When regulations force producers to use more expensive production processes or inputs, some of those production cost increases are passed along to consumers in the form of higher prices. For example, in 2005, the Food and Drug Administration banned the use of chlorofluorocarbons as propellants in medical inhalers, such as the inhalers that millions of Americans use to treat asthma.3 This ban was enacted because of environmental concerns rather than health or safety concerns. Since the implementation of that ban, the average price of asthma inhalers has tripled.4 While individuals with high incomes might be able to absorb this price increase, the higher price may force people with low incomes to make the choice not to buy an inhaler and instead leave the asthma untreated—potentially leading to a real human cost if the person suffers an asthma attack without an inhaler available. When regulations cause the prices of goods and services to increase, lower-income households have to make a choice: no longer buy those goods, substitute them with something else if possible, or buy less of the more expensive good. This can have the unintended consequence of causing lower-income families not to be able to purchase some good or service that is a medical necessity or that would have reduced the risk of accidental death or injury. I have attached a study by economist Diana Thomas that gives more details on the regressive effects of regulations. The cumulative cost of regulations amounts to a hidden, regressive burden. But it’s a burden that could be lightened. In fact, one way of viewing that burden is as an opportunity: retrospective analysis that eliminates a portion of the regulatory cost burden would act as a progressive tax refund. Let me explain with an example that will illustrate how reducing the regulatory burden is similar to a tax refund that primarily benefits poorer Americans. While economists have not yet reached consensus on how to calculate the total cost of regulation, several estimates exist. For example, economists John Dawson and John Seater estimate that regulatory accumulation slows economic growth by about 2 percent per year.5 The latest OIRA report to Congress on the benefits and costs of regulations estimates that a small subset of regulations reviewed cost the economy between $57 billion and $84 billion in 2001 dollars.6 Converted to 2014 dollars, this range is from $76.19 billion to $112.29 billion.7 At the other end of the spectrum, Clyde Wayne Crews estimates the annual cost of regulations to be around $1.882 trillion.8 For this example, I’ll use the midpoint between $57 billion and $1.882 trillion, which is $969 billion. Consider this the annual regulatory burden shared across all households in the economy. As of 2013, there were 115,610,216 households in the United States. We can estimate the regulatory burden per household by simply dividing the midpoint cost estimate, $969 billion, by the number of households. This division yields about $8,386 per household. Now consider a regulatory reform that would reduce this cost burden by 15 percent. If the regulatory cost burden per household is $8,386, then a 15 percent reduction would equal about $1,258 per household per year. This reduction in cost burden is effectively an annual regulatory cost refund and would have different impacts to low-, middle-, and high-income households. In this example, I define a low-income household as a family of five with three children under the age of 18 earning a household income exactly equal to the Census poverty threshold for 2014: $28,252. For the middle-income household, I use the median household income in 2013 (the latest year available): $51,900. For the high-income household, I follow Diana Thomas’s calculations and use a household income equal to 10 times the poverty threshold: $282,520. Table 1 shows what a reduction in regulatory costs of $1,258 would equal, relative to household income and in percentage terms. As table 1 shows, a reduction in regulatory burden of $1,258 would have a much larger effect on the purchasing power of the low-income household than the middle- or high-income households. To the low-income household, the regulatory cost refund would equal nearly 5 percent of one year’s household income. Conversely, to the high income household, it would equal only 0.4 percent of one year’s income. This example shows that a regulatory cost refund of any amount would work just like a progressive tax cut, helping low- and middle-income households relatively more than high-income households. Even better, unlike one-time tax rebates, this regulatory cost refund would repeat every year. One concern that accompanies regulatory accumulation is called regulatory overload. Firms are compelled by law to comply with regulations, regardless of whether the regulations are effective at solving a particular problem. In a 2011 study, psychologist Andrew Hale and his coauthors find that as the number of rules increase, the rules themselves become less effective.9 They also find that as the number of rules increase, companies tend to rely on more rigid, checklist-style compliance strategies to ensure compliance with the letter of the law rather than proactive risk management strategies that may be more effective at reducing health and safety risks in the workplace. They call these problems regulatory overload. Certainly, as regulations accumulate, risk managers’ attention will be spread across a greater number of rules. If any of those rules are not actually effective in reducing risk, the attention paid to those rules will detract from compliance with functional rules. As I have previously testified,10 the need to eliminate or modify nonfunctional regulations from the accumulated stock has been widely recognized by members of Congress and every president since Carter.11 Functional rules address current, significant risks; mitigate some amount of those risks through compliance with the regulations; and do not have significant unintended effects or excessive compliance costs relative to their benefits. Nonfunctional rules are missing one or more of these features. The key to achieving significant amelioration of the problem of regulatory accumulation is first identifying as many nonfunctional rules as possible and then either eliminating them or changing them so that they become functional. Figure 1 shows just how little the regulatory process has changed, despite these presidential efforts. Since 1975, the CFR has expanded in 30 of 37 years. In those 30 expansionary years, 117,294 pages were added to the CFR. In contrast, in the seven contractive years, 17,871 pages were subtracted from the CFR—for net growth of nearly 100,000 pages. 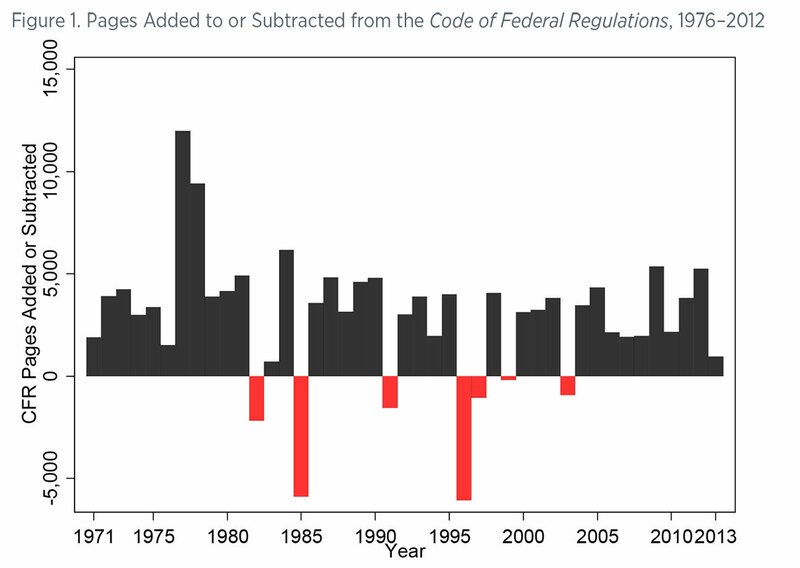 Previous efforts to eliminate obsolete regulations have removed only very small percentages of existing regulations from the books. The failure of past regulatory review efforts likely stems from a fundamental misalignment of incentives: agencies, despite direction from the president, have incentives to maintain and increase their regulations to maximize their budgets and control over their portion of the economy. In turn, to retain regulations that would be eliminated otherwise, agencies may either hide or fail to produce information that would help identify obsolete or ineffective regulations in the first place. We should not expect agencies to give any better assessments of their own rules than professors would expect of students grading their own tests. Similarly, individuals in agencies have little incentive to provide information that would lead to a rule’s elimination or the choice not to produce a rule.13 In general, employees—including economists—are professionally rewarded for being part of teams that create new regulations or expand existing regulatory programs.14 Conversely, employees are rarely rewarded for deciding that a regulation should not be created. This is unfortunate, because specialists in agencies are likely to have some relevant information about which rules are nonfunctional. However, the issues that have plagued previous, executive branch–led efforts at regulatory reform can be overcome. In previous research, I identified 11 characteristics of successful regulatory reform, derived from lessons learned by studying the Base Realignment and Closure (BRAC) process, regulatory reform in other countries, and previous attempts at retrospective review in the United States.15 I highlight a few of these below, for the purposes of assessing the reforms currently under consideration. 4. not interfere with or duplicate other rules. It is vital that the assessment of a rule with respect to each of these criteria be performed objectively. If the body tasked with the analysis of a rule has incentive to find that the rule is functional or is nonfunctional, the review risks becoming an exercise in advocacy rather than objective analysis. The SCRUB Act, for example, creates a commission with the authority to hire analysts and experts necessary for such an assessment and to collect essential information for those purposes. The SCRUB Act sets forth criteria for regulatory assessment that are not very different from how I define “nonfunctional” rules in my own research. While it is wise to build in flexibility for the commission to devise new criteria in response to future lessons learned, it is equally important that any commission be required to publicly disclose its complete assessment criteria and take comments from the public on them. 2. The identification process must be broad enough to identify potentially duplicative regulations. Duplication and redundancy across agencies may be a large source of nonfunctional rules. For example, multiple agencies through different regulations may address food safety. In light of this source of nonfunctional rules, analysis that is focused on individual rules or the rules of a single agency may not capture factors (e.g., conflicts, duplication) that indicate certain rules are in fact nonfunctional. 3. The analysis of the functionality of rules should use a standard method of assessment that is difficult to subvert. Nobel Prize–winning economist Ronald Coase famously said, “If you torture the data long enough, it will confess to anything.” So it goes with any analysis: those who perform the analysis can choose the data to examine, how to analyze them, and the framework within which to present results. This is a primary reason why I recommend that retrospective analysis of regulations not be left in the hands of agencies that have incentive to find specific results. However, a similar logic applies to an independent body that analyzes regulations. In the long run, we would have to worry about whether the body can maintain its independence and whether political or other pressure would be exerted on the body to subvert its analyses to serve an agenda. The best way to prevent such subversion is to require a simple, transparent, and replicable methodology of assessment. Under the SCRUB Act, the commission is required to specify a methodology for assessment. Doing so publicly and before beginning the assessment will help achieve a transparent, objective end product. 4. Whatever the procedure for assessment, assessments of specific regulations or regulatory programs should focus on whether and how they lead to the outcomes desired. The SCRUB Act lists as one of the criteria for assessment “whether the rule or set of rules is ineffective at achieving the rule or set’s purpose.” To meet my criteria, this phrase should mean achieving desired outcomes, as opposed to producing outputs. A rule may lead to an increase in an output, such as increased safety inspections, but that does not guarantee that there has been an increase the outcome, safety. 5. Congressional action—such as a joint resolution of disapproval—should be required to stop the recommendations, as opposed to a vote to enact or not enact. The SCRUB Act could be improved if it were modified to limit formally Congress’s ability to subvert the process of selecting rules for elimination or modification. As the creators of the BRAC process recognized, every base targeted for closure had a champion defending it in Congress: the member whose constituency would be affected by the closure. So it would likely be with regulations slated for revocation. A better solution would be to follow the BRAC experience and require that a SCRUB Act commission’s recommendations take effect automatically unless Congress were to enact a joint resolution of disapproval of the entire set of recommendations—with no amendments allowed. 6. The review process should repeat indefinitely. The SCRUB Act provides for a dissolution of the commission by a specific date. Given the possibility that the commission cannot evaluate all regulations before that date, it may be worthwhile to extend the life of the commission until all regulations are evaluated at least once, or even have the commission continue on an ongoing basis. The regulatory process will lead to regulatory accumulation again. This commission could balance the tendency to accumulate regulations with a deliberate and streamlined process for eliminating nonfunctional regulations if and when they appear. Regulatory accumulation in the United States, with its adverse impact on economic growth by impeding innovation and entrepreneurship, is now a widely recognized problem. Furthermore, the costs of regulation are disproportionately borne by low-income households and the accumulation of regulations may make us less safe overall as compliance becomes more thinly spread between functional and nonfunctional rules. Regulatory reform that reduces the overall burden of regulations would act as a progressive tax refund for American households. Nonetheless, the problem has not been meaningfully addressed despite the efforts of several administrations. One reason it has been hard to address regulatory accumulation is the difficulty of identifying nonfunctional rules—rules that are obsolete, unnecessary, duplicative, or otherwise undesirable. An independent group or commission—not regulatory agencies—seems required to successfully identify nonfunctional rules. The SCRUB Act has several characteristics that make it more likely to succeed where previous attempts have failed. First, it appoints an independent commission to identify nonfunctional rules. Second, the act requires that the commission establish a methodology before beginning the assessment of rules, thereby minimizing opportunities for the assessment to be subverted by special interests. Third, the act establishes criteria that the commission would use to identify nonfunctional rules, and these criteria are primarily based on fundamental problem-solving and sound economic thinking. What If the US Regulatory Burden Were Its Own Country?